Salsa & spice add a ton of flavor to these little Black Bean Sliders. Load them up with your favorite toppings, like guacamole and sour cream and you have a fiesta in the making! First of all, I must confess that I didn’t get these to you when I intended. But life gets busy and between 3 kids, being a pastor’s wife, and building 2 businesses, it’s a good day when I put food on the table! If it was just me fending for myself, I’d be living on fruits & veggies, chia seed bowls, homemade ramen soup and probably SunButter sandwiches. Alas, I do have a family to cook for, so I need to be more creative but the recipes need to be quick! How many of you know what I’m talking about? When the kids are little, you’re just thankful you can take a shower during nap time. Then you think you’ll have more time when they reach school, but then there is drop off & pick-up with a lot of parties & school functions in between. I haven’t even gotten to sports or activities AFTER school. But High School will be easier, right? That’s what I thought but was so very wrong. These black bean sliders are my new favorite burger. The bean patty itself if loaded with 2 types of beans (black & navy), spicy salsa then bound together with flax meal and gluten-free crushed tortillas. Then, we topped off these babies with sliced tomatoes, red onion, guacamole, sour cream and lettuce. Throw on some jalapeno and cheese and it’s a fiesta in your mouth! I’ve made similar black bean patties before, but never as a slider! Boy, was I missing out! A batch of these are perfect for family dinner, birthday parties, get-togethers and game-day. The leftovers (if you have any) keep really well in the refrigerator, and pack perfectly for next day lunches, or as a quick snack. So do you need an easy dinner to add to the weekday mix? Are you tired of rushing home and trying to figure out what to make that’s delicious and won’t take hours to put together? 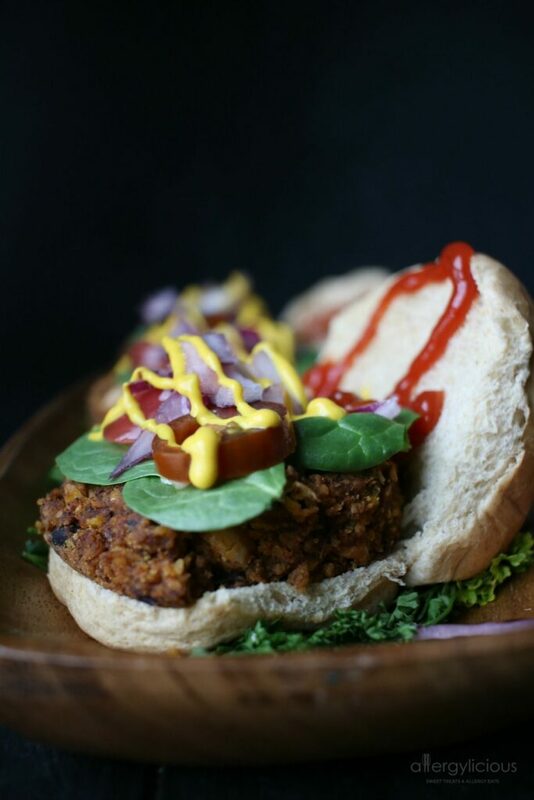 THEN YOU WANT TO TRY THESE BLACK BEAN SLIDERS? PIN IT to your Sandwich, Appetizer, or Dinner Board to SAVE FOR LATER! Find me on Pinterest for the newest, delicious, allergy-friendly foods, like this one. 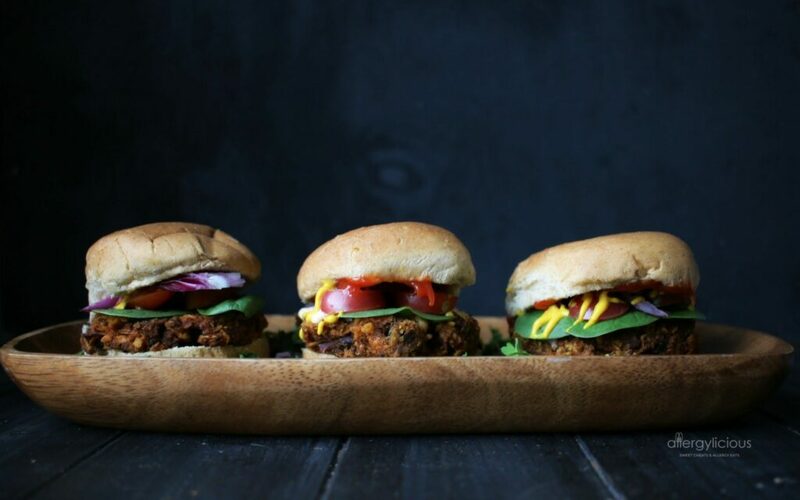 Salsa & Spice give these meatless sliders a ton of flavor which make it the perfect addition to your next dinner or get-together. Place fine mesh strainer over a small bowl. Pour salsa inside strainer and gently push down to remove extra liquid. Place salsa in a larger bowl. Make your flax egg using the liquid from salsa. If you need any additional liquid, just make up the difference with water. Set aside. Add beans to salsa and mash until no whole beans remain (or toss in processor and pulse a few times). Toss in tortilla chips, onion, mayo, chili, cumin, salt, and flax egg. Mix until incorporated and let stand 5-10 minutes as you get your griddle hot. Drizzle griddle or non-stick skillet with oil and heat on medium high. Reduce to medium. Form bean mix into small burgers using an ice cream scoop, place on heated griddle then gently press down to form burger shape. Cook 3-4 minutes per side, until lightly browned and heather through. Repeat until all burgers are done. Serve on small slider buns and top with guacamole, sliced tomatoes, greens, onions and sour cream. The recipe itself if GF, however, be sure to use GF buns to keep it safe. Keep those broken pieces from the bottom of your tortilla chips in a little baggie. Crush them and use those for the crumbs. Be sure to follow Allergylicious on Facebook! or Find me on Instagram and Tag #allergylicious with your awesome remakes! AND sign up for our Newsletter to get all the latest recipes FIRST! This sounds like a perfect recipe for my next burger, Nicole. Can’t wait to taste it! Thanks so much. This beats any frozen vegan burger or dry restaurant burger. Hope you get to try it soon. Homemade veggies burgers are such a staple! Love a good to go bean burger! These look like an absolute staple for weeknight meals. Oh yes! They are also adorable for the littles or any type of large get-together. Excellent photo with the three burgers in the boat, Nicole! Makes me wanna eat all three of them. Even better that black bean burgers have been on my list for ages! Aww, thanks Haute! I must confess that I did eat all 3 of them, so you wouldn’t be alone, lol. Nicole, this recipe is dynamite! I will take corn chips in anything and love the use of them in this recipe. Can you believe I have never made a bean burger?! I think you’ve convinced me! Really? 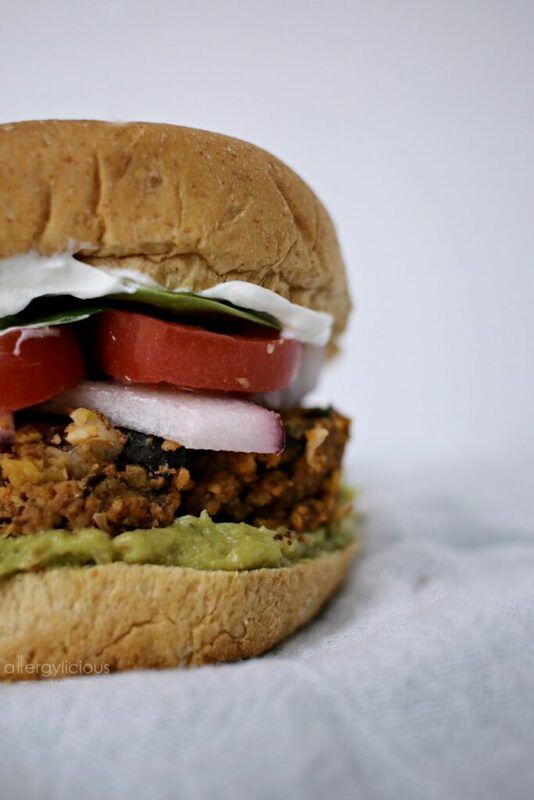 Never made a black bean burger? Oh, well I’m glad I convinced you! And if you love corn chips (I could eat them all the time too) then you’d totally love this burger. Oh, I love a good black bean burger. These look super flavorful! They really are! If you like them spicier, then use HOT salsa. I actually mixed spicy red & a green verde together in 1 batch and that still turned out awesome. So versatile. These little burgers are so cute! And they look so yummy! These look so tasty! I love that you added tortilla chips! Totally trying these soon! Everytime someone goes to throw the broken pieces away, I feel like a hoarder (lol) but it’s totally worth it so you don’t have to buy crumbs. Girl, I totally hear ya on the life is busy stuff! Dinner that isn’t leftovers is a total win! 🙂 I make Black Bean Salsa Burgers too, so I know I would love these! A family fave! Glad I’m not the only one! Crazy that we blog about food and yet still have a hard time getting it on the table at times 🙂 But yes, I am all about easy and I’d love to hear how you make your burgers, bet they are fabulous. I am ready for this party of flavors to happen in my mouth! These black bean sliders look ahhmazing! Bean burgers are the best! My husband would definitely go for this recipe so I’ll be sharing ASAP!! How do you do it all, and when do you sleep?! Amazing! I love a good bean burger, and these cute sliders look delicious. Those do look DELISH! I love that you used tortilla chips in them. I forget that as an option for breadcrumbs – so easy, inexpensive, and something my husband can eat! My husband always wants to throw out the crumbs but I don’t think he realized how I use them until he saw me making this recipe. They do work perfect for recipes that you need to add bread crumbs for sure. These black bean sliders sound terrific! Such a family friendly meal. Oh yes! Hubby & kids all love them, so it’s a perfect option for putting a quick and tasty meal together. 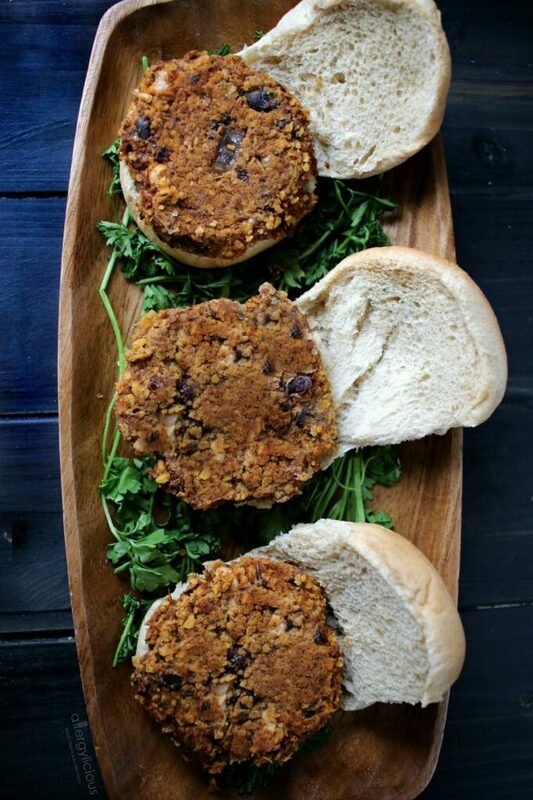 I LOVE black bean burgers and as sliders, these look amazing! So perfect to entertain with! I make mine with salsa as well, so good! I love black bean in everything, especially burgers! Looks very very delicious. Thanks Sina. Who needs beef when there are black beans, right? Yes, I love black beans! They just are so good . Well, it’s quite clear I like burgers. And black bean is one of my faves! I love your little signs. SO cute!